Preliminary design plan for a large scout cruiser. This design is very similar to P.D. 144 (see Photo # S-584-083), a so-called "Battle Scout", but differs in having main battery guns (10-inch) of lesser caliber than capital ships (14- or 16-inch). Note the provision of side armor in way of the turrets, absent in P.D. 144 but provided here and also in P.D. 150 (see Photo # S-584-089). Other than armament, this design differs from P.D. 150 only in having less beam. No ships of this type were built. 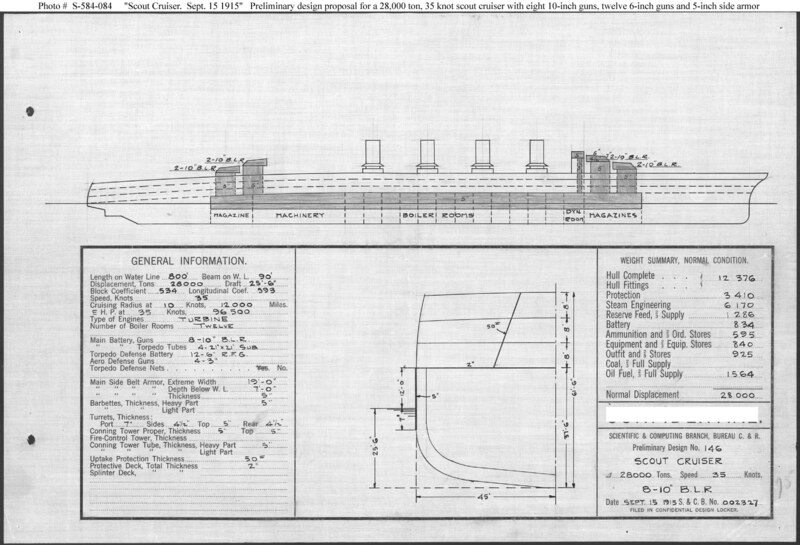 This plan provides eight 10-inch and twelve 6-inch guns, turbine machinery, and a speed of 35 knots in a ship 800 feet long on the water line, 90 feet in beam, with a normal displacement of 28,000 tons.